Some of us believe that love is not love if it has conditions. That love is not love if it’s as erratic as its bases but is something that remains even if every good thing fades. We call this unconditional love—the one that everyone dies to receive but finds difficult to give. The one that’s so pure and rare. However, there have been many misconceptions about loving with no conditions. We have to eradicate them and welcome its new, real sense. Let’s stop thinking that loving unconditionally entails being subservient. No, it shouldn’t turn us into people who always say yes—who will compromise their worth in order to honor the person they love. It shouldn’t hinder us from empowering ourselves just because we are drained in securing the relationship. Unconditional love shouldn’t make a pushover in us. It’s rather giving what they need and even want, yet we know there should be limitations because we pick what is most beneficial to them. It shouldn’t put us on the lower scale, but serve as the balancing force in the relationship, producing mutual respect. Let’s stop thinking that loving unconditionally means tolerating mistakes. We accept their imperfections. We don’t mind their little shortcomings. But we should never put up with recurring, intentional mistakes they commit to. Unconditional love sees and should mind but doesn’t want. It rebukes and corrects but with care and gentleness. We don’t need to force them to change but we need to show them we are also after their betterment. Unconditional love doesn’t shut our mouth. It should make us expressive of how we feel according to what we see because, despite their failures, we are going to prove we still love them. 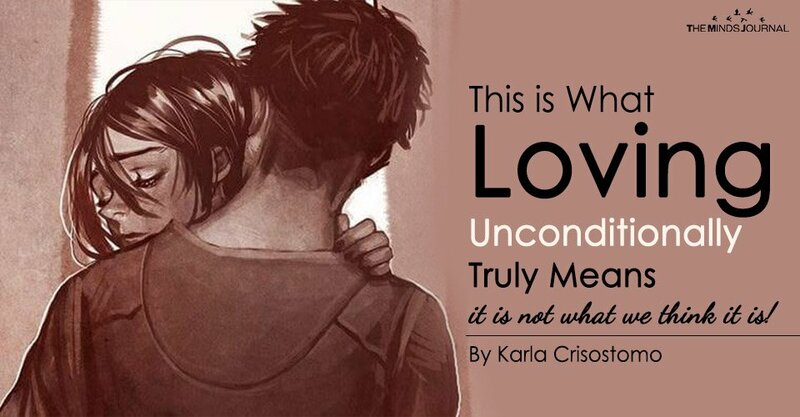 Let’s stop thinking that loving unconditionally requires our whole life. Pouring out so much for them and not expecting anything in return is a good means of showing we truly love them, but at the same time we should save something for ourselves. Let’s not compromise our own needs as an individual. Let’s not exhaust everything because how can we further give when we lose resources? How can we make things work when everything goes awry after we have failed to make time for taking care of our own well-being? How can we achieve the dreams we build with the person we love when we never took time to lay foundations for our own? How can we say we can never leave them when we have left ourselves in the first place? It’s just a cycle. We give what we have and so it’s better to save up. Unconditional love shouldn’t teach us to lose ourselves, it rather teaches us to build a strong, complete life as a foundation of good relationships in other aspects. Let’s start thinking that unconditional love is something that magnifies our worth. Oftentimes we think that we cannot give unconditional love if we are also considering our worth. But the truth is, unconditional love is way given better if we choose to protect the worth we are made with. It makes us wiser. And when we love with wisdom, we learn that the true meaning of unconditional love is loving for the growth of both parties. It means taking care of them while we take care of ourselves. It means making them happy while making ourselves happy. It means instilling in them the idea that we are worth given the same amount of love. It’s never one-sided as many people think. It’s never just allowing the person we love to overlook the responsibility of protecting our very own value. Unconditional love makes us firmer, standing upon our principles, keeping our worth untainted and cherished. It’s being confident that we are capable of loving unconditionally without losing ourselves, because we do the same to ourselves. And so if they still choose to leave, it’s not really a total loss.